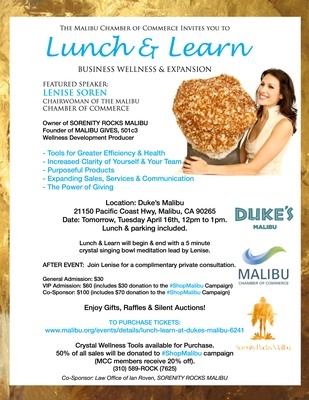 Name: Lunch & Learn at Dukes Malibu! Join us monthly for a featured guest speaker at the iconic Dukes Malibu. Network, enjoy a tasty lunch and settle in for a presentation backdropped by the waves breaking at Malibu's original surf beach. Valet parking included.